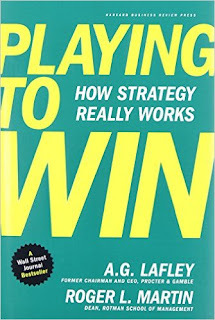 I recently read Playing to Win: How Strategy Really Works by A.G. Lafley, Chairman and CEO of Procter and Gamble, and Roger L. Martin, Dean of the Rotman School of Management at the University of Toronto. The book identified five choices businesses have to make to win, called the Cascade of Choices, because each one cascades from the prior one. And I thought, bravo! But then I tried to think of banks that are making these choices. Banks rarely had to choose. Instead of focusing on small and medium sized, closely held businesses and the personal banking/wealth needs of their owners (note: Cobiz Financial), we choose to be everything to everyone in towns where we operate. This has sapped resources to the point of ineffectiveness, never committing to any particular path for fear of being wrong. In sports, you can never be the hero without the risk of being the goat. In our risk management meetings deep within the bowels of headquarters, we work diligently to avoid being the goat, never allowing us to be the hero. Here are Lafley and Martin's Cascade of Choices, with my commentary following each one. 1. What is your winning aspiration? The purpose of your financial institution, the motivating aspiration. I've called this vision, future-picture, high definition destination, and aspiration. It's all the same thing. What does your financial institution aspire to be? If you hear someone say that aspiring doesn't matter, ask yourself: Are they holding you down? 2. Where will you play? A playing field where you can achieve your aspiration. Equally important, where will you not play in achieving your aspiration? I recall banks that went toe-to-toe with the old Commerce Bank of Cherry Hill, New Jersey on locational convenience. Commerce paid top dollar for prime locations touting extended hours and dubbing themselves America's Most Convenient Bank. Today, those banks are unwinding excess branch expenses that resulted from playing on Commerce's turf. 3. How will you win? The way you will win on the chosen playing field. On Service! I take my liberties poking bankers on the service imperative because superior service must graduate beyond the platitude it has become. 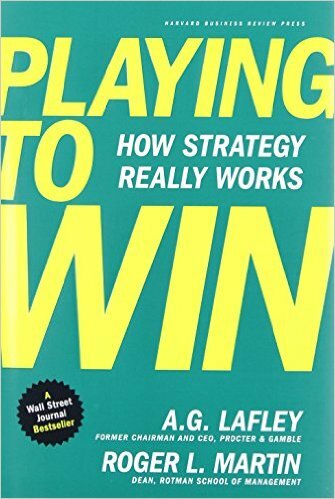 If you will win on your chosen playing field on service, then you focus on customers proven to appreciate service, price accordingly, hire capable employees that can be of service, develop them to hone their skills, and reward their success. 4. What capabilities must be in place? The set and configuration of capabilities required to win in the chosen way. The author of a recent American Banker article opined that it wasn't likely millenials will replace human interaction with financial technology. They still wanted someone to advise them and help them with their budget. Do banks have this ability now? If a millenial walked into your branch for financial advice or to help with their budget, could your bankers do it? 5. What management systems are required? The systems and measures that enable the capabilities and support the choices. I recently penned a BAI Banking Strategies article Linking Accountability to Strategy. I took the wild leap of faith that a bank would have branch and officer profitability reporting abilities. My experience tells me many don't, and they often revert to lender production and portfolio size to maintain accountability. This may have unintended consequences that is not consistent with your strategy. So in moving through the Cascade of Choices, make sure you have the management systems in place to execute on your strategy. "This is A.G. Lafley's guidebook. Shouldn't it be yours as well?"